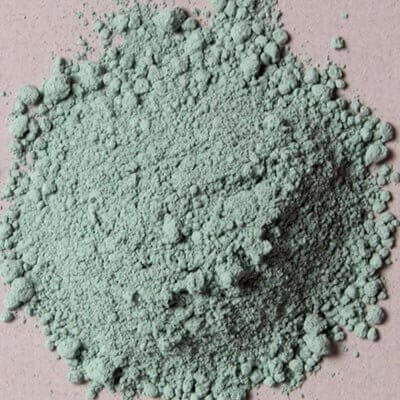 Nicosia green earth is the natural mineral glauconite, a greenish mineral of hydrated iron potassium silicate containing small amounts of aluminum, calcium, magnesium, sodium, and numerous trace elements. It is a bright green mineral that looks like tiny flakes of the mineral mica, or small lumps of clay. The color of glauconite varies considerably from pale green, bright green, bluish-green, olive-green, and black-green, depending upon its constituent elements. Our Nicosia green earth is from deposits in southeastern Cyprus near the region of its capital city. The word glauconite is derived from the Greek word glaucos, originally meaning gleaming, later bluish green, and then silvery or gray. It has been in painting since ancient times. Restorers have proved through X-ray diffraction that the famous pigments of past centuries known as Veronese and Bohemian terre verte are in essence glauconite. Green earth, also widely known as terre verte, is primarily composed of the minerals celadonite and glauconite. The presence of celadonite or glauconite, minerals of complex silicate composition, produces colors that vary from cold bluish greens to warmer yellow and olive hues. It may have been formed originally from biotite (a dark-colored mica), but other minerals, and even organic matter, may change it into glauconite. The mineral has a micaceous structure, that is, a silicate crystallized in monoclinic forms that readily separates into very thin leaves. It is characteristically formed on submarine elevations of ancient seabeds ranging in depth from 30 to 1,000 meters (100 to 3,300 feet) below sea level, and in the sedimentary rocks of different geological systems. Usually it forms small (from 0.8 to 1.5 mm in diameter) green round or angular grains. The most famous deposit of green earth was found near Verona, Italy, and this mine was active until World War II. Other mines produced variations in color and texture of the pigment: Baltic states, Bohemia, Cypress, France, Hungary, Poland, Saxony, Tyrol, and the Mendip hills of England. Our green earth is from Cyprus where well known deposits of glauconite are found today. Glauconite is not found in nature as large accumulations, but rather in combination with clay or sand. Its content rarely exceeds 50% of the deposit, making it necessary to process the mineral for use as a pigment. The preparation of glauconite is usually done with levigation, sifting and sometimes electromagnetic separation. Sometimes clay or sandy minerals, tinted with aniline red or copper pigments, have been marketed under the guise of glauconite. Ethyl alcohol can be used to detect the presence of aniline red, while mixing a sample with ammonium hydroxide can reveal the presence of copper-based colors. Earth pigments, and green earths in particular, are often described as the most permanent of colors. Earths are not affected by sunlight or by atmospheric conditions. 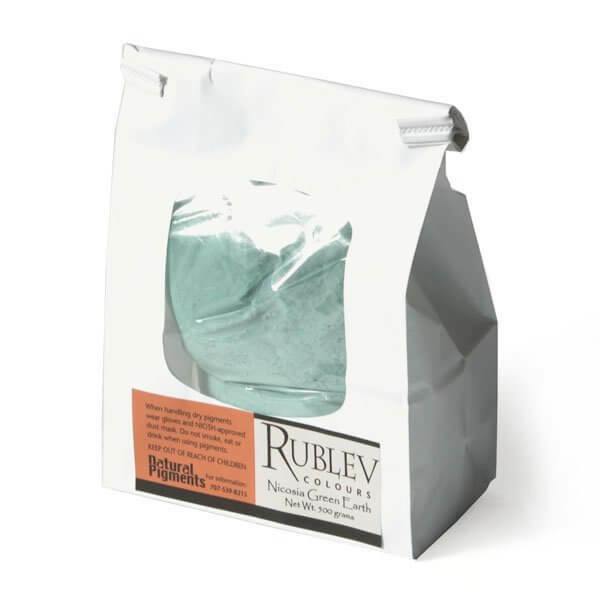 They do not react with solvents, but according to Feller, green earth is partially soluble in acids and alkalis. 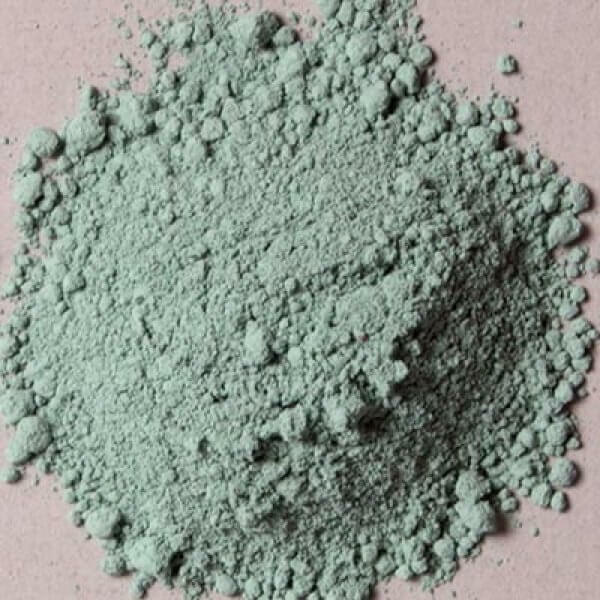 Green earths have reasonable tinting strength and covering power, and the pigment is easily ground. Since it contains some clay, green earth absorbs oil at a moderate to high rate.